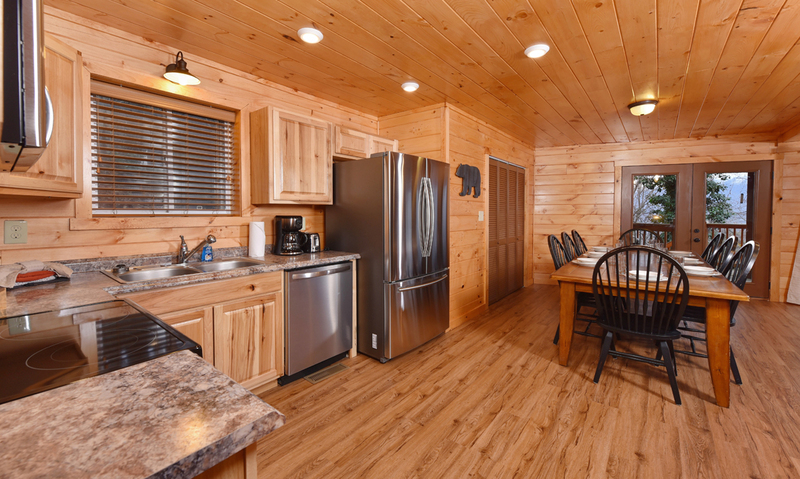 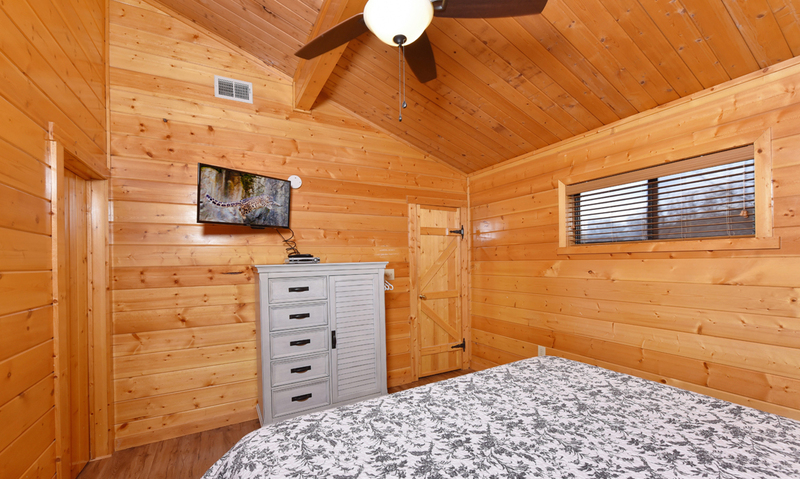 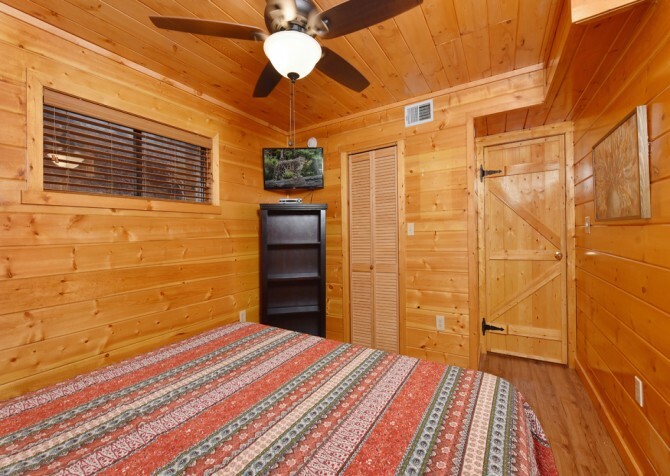 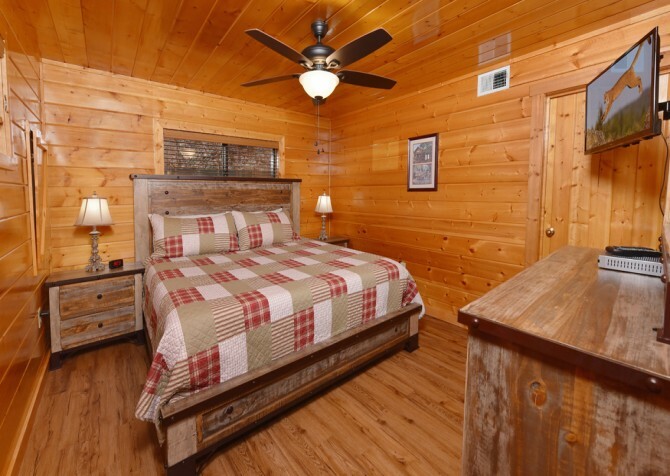 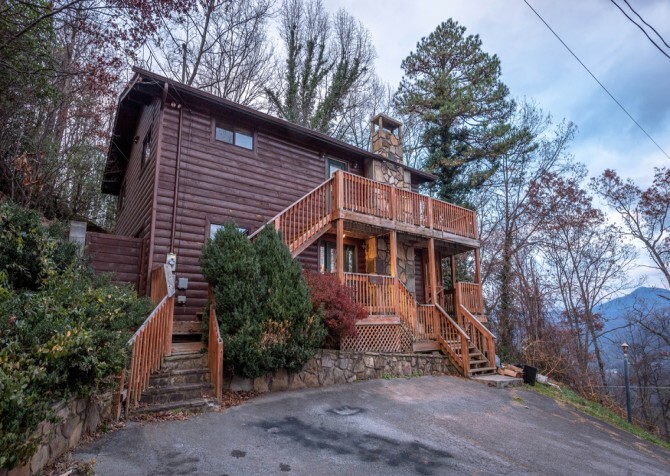 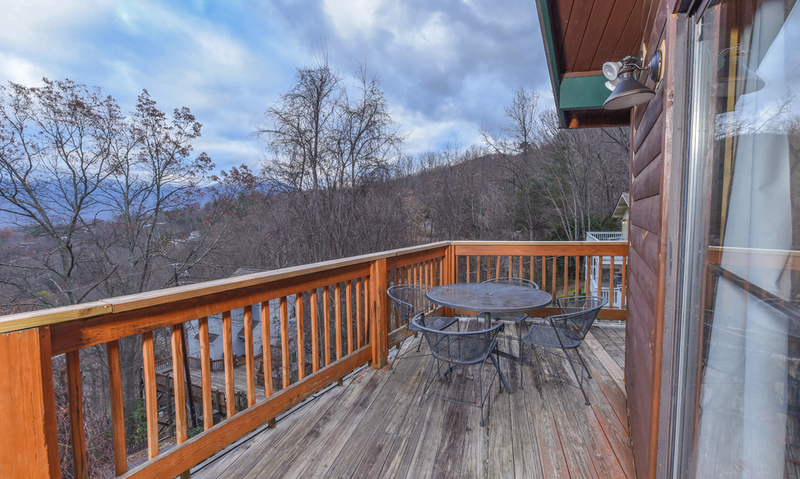 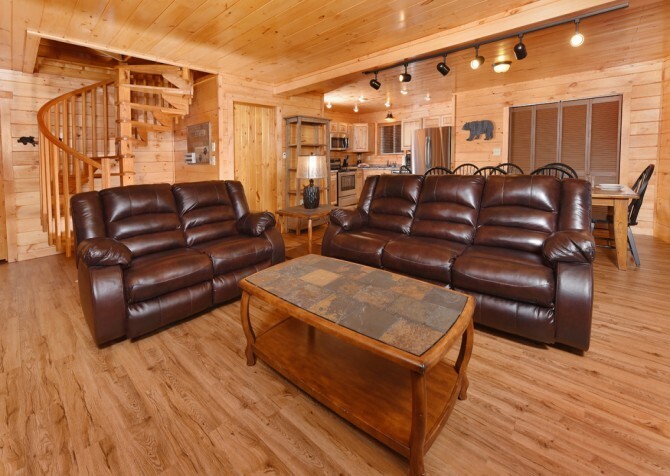 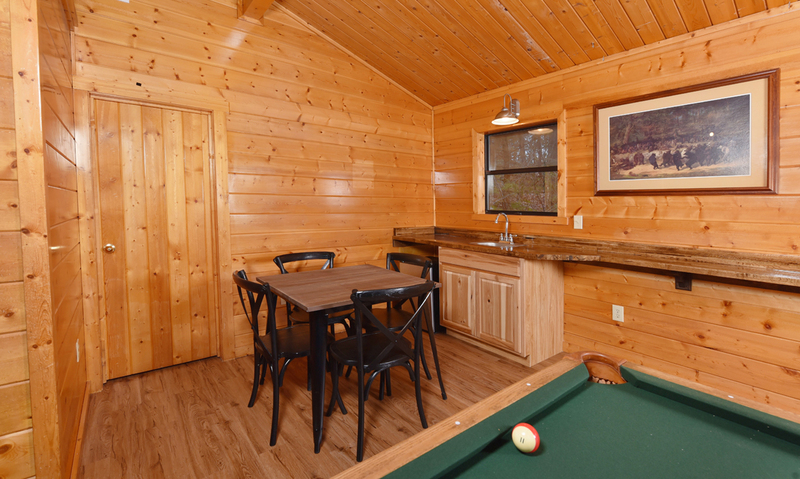 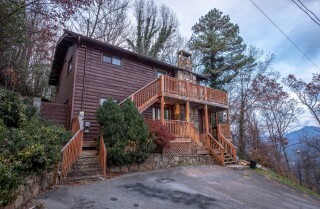 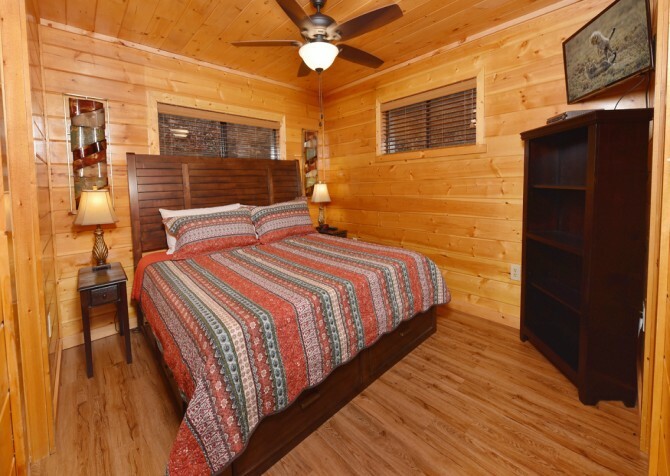 Only minutes away from downtown Gatlinburg, Bearfoot Lodge is the perfect escape for up to 10 guests to relax across 4 spacious suites housing king-size beds, flatscreen TVs, and cozy furnishings. 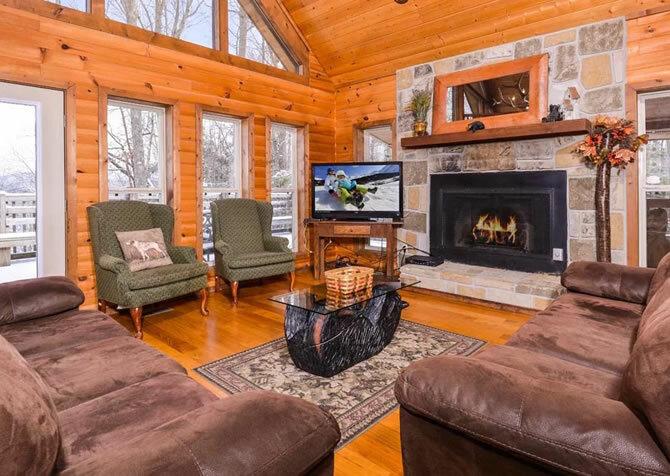 Sink into cushy leather couches in either of the 2 living rooms boasting large flatscreen TVs, dreamy natural lighting from impressive windowed walls, and stone wood-burning fireplaces to sit around during cool mountain evenings. When not dining at the numerous delicious restaurants in Gatlinburg, cook meals together in the charming fully loaded kitchen with modern appliances and farmhouse-style cabinetry before settling in around the 8-chair table set to eat together for family style meals before hours of fun during game nights in the cabin with all your favorites from home. 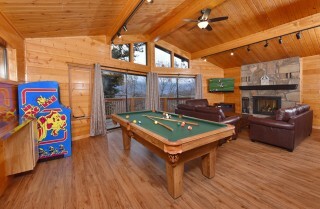 Located in the Chalet Village, your stay in Bearfoot Lodge is privileged to community pool access complete with a waterslide for the little ones, tennis courts, and clubhouse with a full-size ping-pong table! 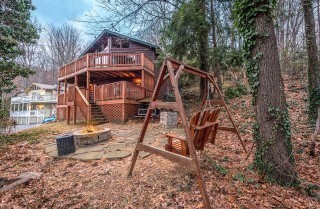 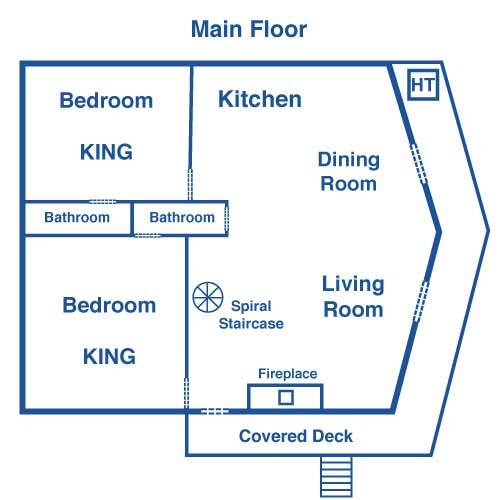 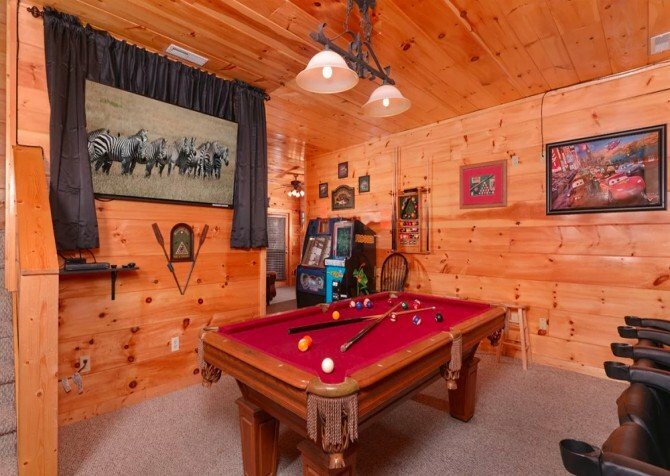 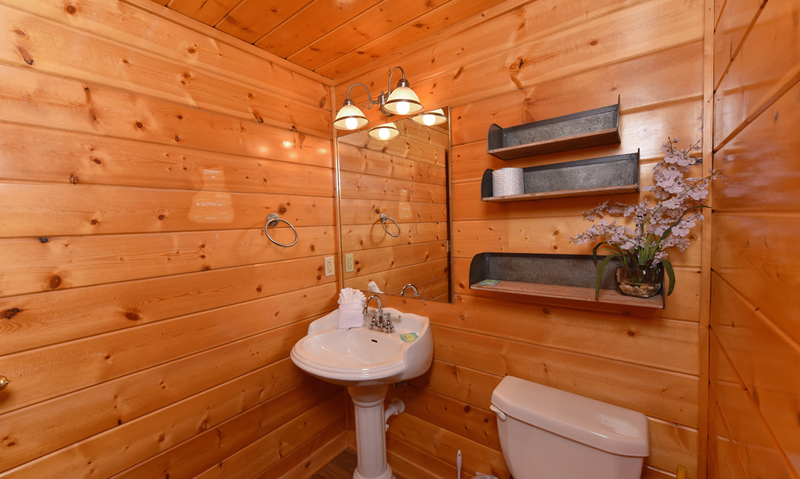 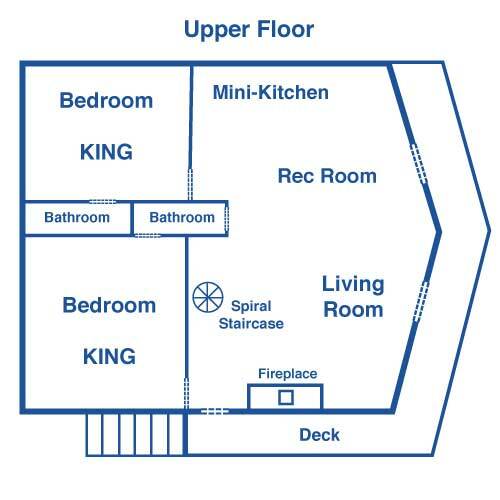 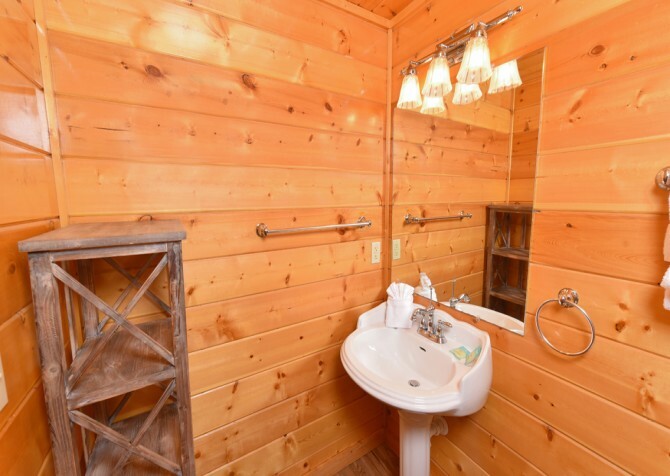 Ample fun amenities abound back in the cabin, however, where laid-back days are filled with arcade games and pool in the rec room and tranquil evenings are well spent around the outdoor fire pit in the porch swing or in the steamy waters of the outdoor hot tub. 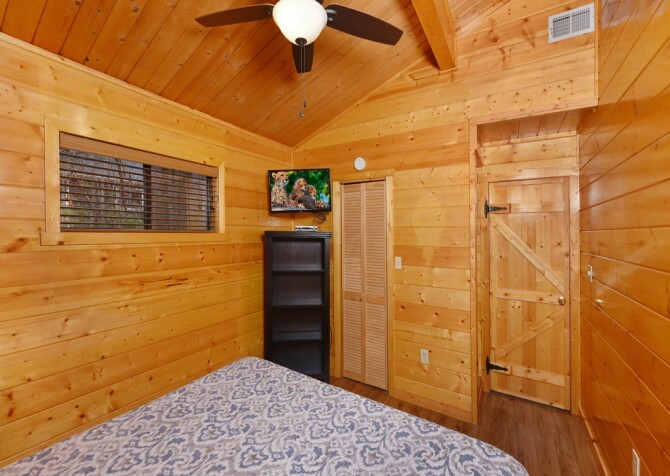 This backyard area is great for our furry guests to this pet-friendly cabin when they aren’t napping in the sunlight on the deck or curled up near the fireplace. Bring the kids for a multi-family vacation, escape with a few other couples to the mountains, or plan the perfect bachelorette weekend getaway to Bearfoot Lodge and indulge in the best of relaxation and Smoky Mountain fun. Two homey living areas lend ample room to both spend time together as a group and spread out for quiet TV viewing and reading by the fire. 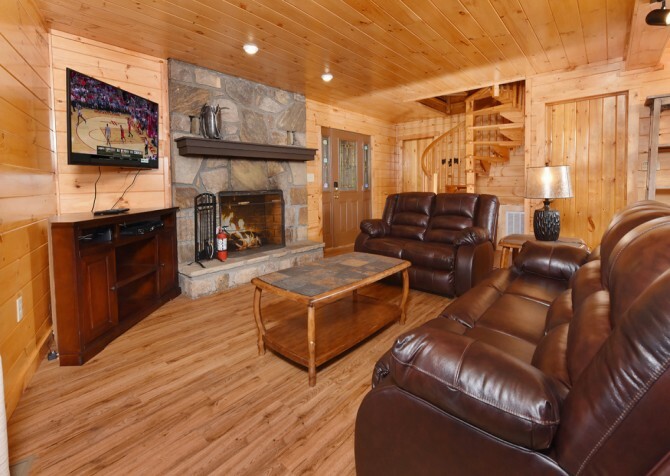 On the entry level, the open concept of the kitchen, dining room, and living room provides a great space to kick back while watching the big game on the large flatscreen TV and cooking everyone’s favorite game-day eats with a self-serve buffet on the dining room table. Move group games from the dining room to the living area for late nights of laughter and charades while a cozy wood-burning fire dances in the stone fireplace or move the fun to the upper level’s living room adjacent to the recreational room complete with a wet bar! 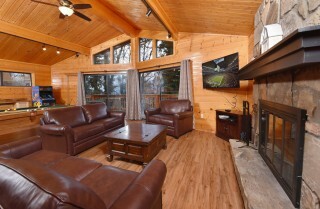 Both cozy living rooms boast plush leather couches to sink into for the perfect afternoon naps after morning hikes, large flatscreens to watch movies during cabin downtime, and gorgeous wood flooring and mountain-motif décor. This aesthetically well-balanced kitchen will draw you in and make you want to cook more than you might cook at home with the sparkling countertops, charming farmhouse-style cabinetry, and sleek black appliances. 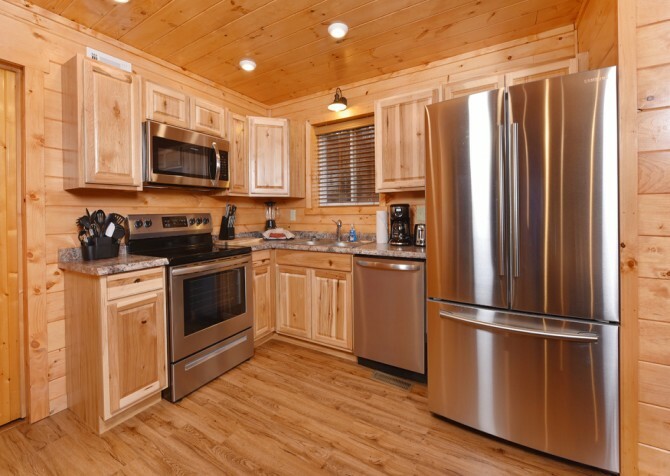 Forget having to pack cookware and utensils because everything guests could need to cook quick meals and multi-course dinners is conveniently stocked. Enjoy foods for every kind of diet with the assistance of the blender for breakfast smoothies or margaritas, the toaster for whole-wheat toast or quick preparation of refrigerated snacks, and the coffeemaker for a smooth cup of joe or hot water for English tea. 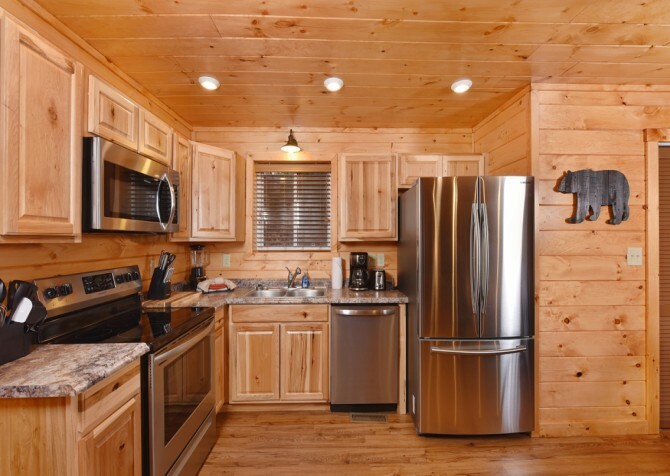 Reheat leftovers from your Smoky Mountain favorites like The Peddler Steakhouse and Flapjacks Pancake House in the microwave for easy midnight craving solutions or between meal fixes while everyone is spread out enjoying the community pool, napping in their bedrooms, and taking in the wooded mountain views on the deck. 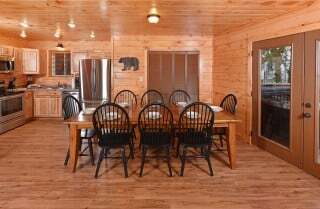 The long wooden dining table is a call-back to family dinners without phones or interruptions where guests can enjoy intimate moments with friends and family and create a few of your favorite memories. 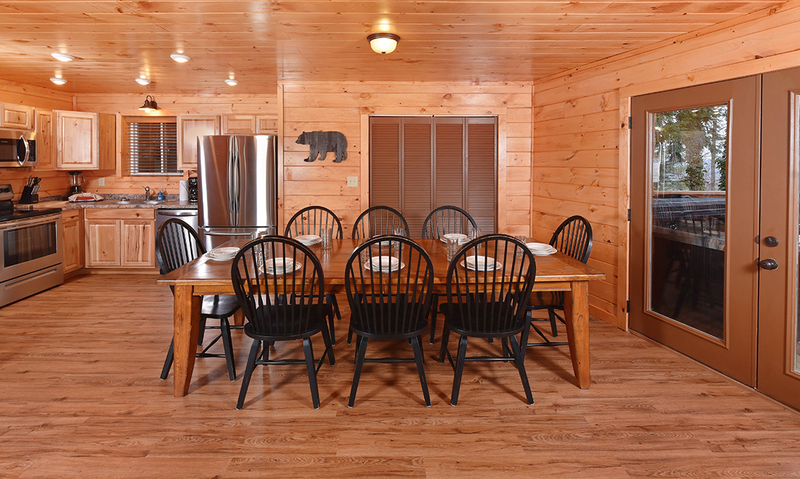 The polished wooden table is lined with 8 chairs, providing a warm atmosphere to share stories and delicious meals. After clearing the table of the cabin’s dishes and letting the dishwasher do the majority of the cleaning, share dessert wine and swap stories with friends before turning into bed each evening. 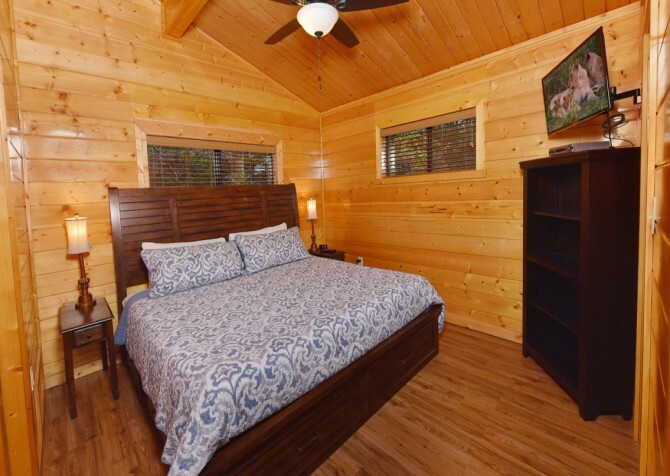 King-size beds, cozy quilts, private bathrooms, and forest views await guests in all 4 bedrooms of Bearfoot Lodge. 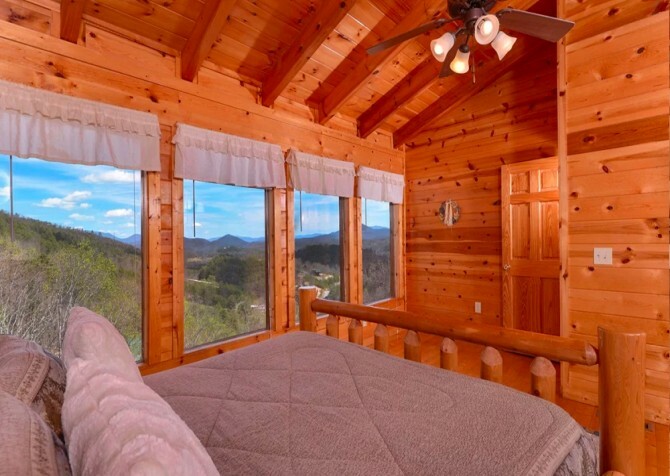 Escape to the comfort of each room for private TV viewing on the flatscreen TVs, a peaceful nap in between Smoky Mountain excursions, and ample space to unpack suitcases into dressers. 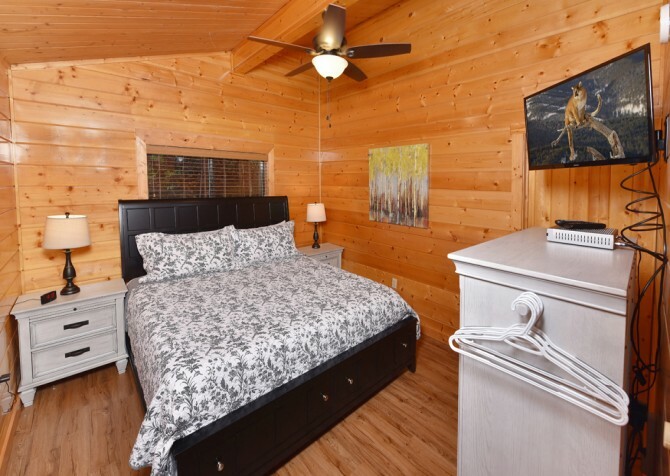 Bedside tables and numerous outlets mean charging phones and laptops are easily accessible for every guest in addition to the comfort of ceiling fans and homey atmospheres to fall asleep each night. 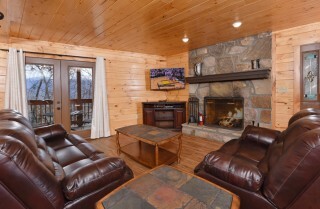 Additional guests can enjoy movies and a warm fire while cuddling on the sleeper sofa in the upper level, too! 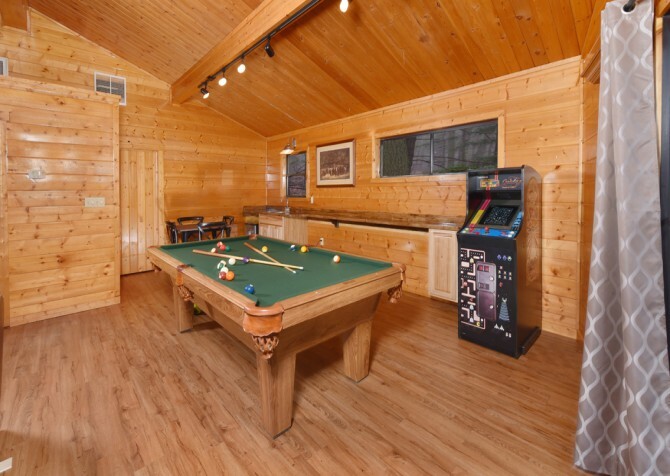 Lovely wooded views, a spacious open floorplan, arcade games, and a full-size pool table lend a great answer to any threats of boredom! Play a game of cards around the table while the kids try their hand at all the classic arcade games their parents grew up playing. 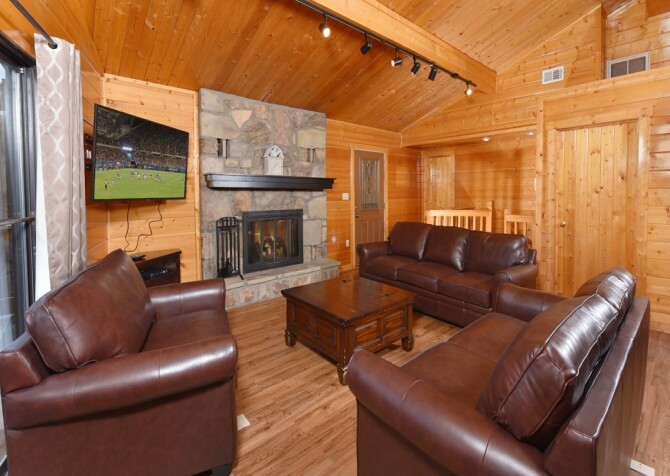 Share bottles of your favorite local wine and beers while watching the big game on the flatscreen TV nearby and shooting some pool with friends on laid-back afternoons. Keep score while seated on the stools at the wet bar before getting your chance on the pool table as the flames dance in the nearby stone fireplace each night and guests hang out in the recreational room, enjoying the time well spent, together, in the Smokies. 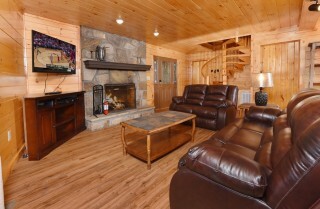 No need to drive anywhere to enjoy the great outdoors during a stay in Bearfoot Lodge! 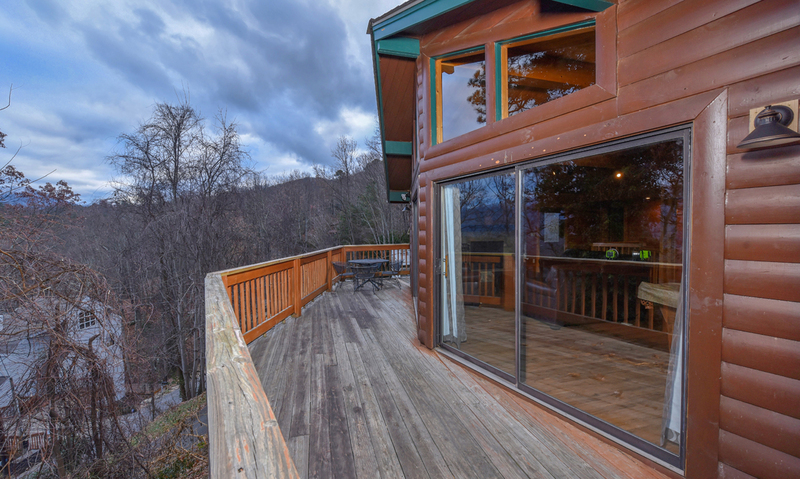 Relax in the rocking chairs and sip on freshly brewed coffee during quiet mornings as the sun slowly makes its rise above the tree line and the sounds of birds fill the forest. 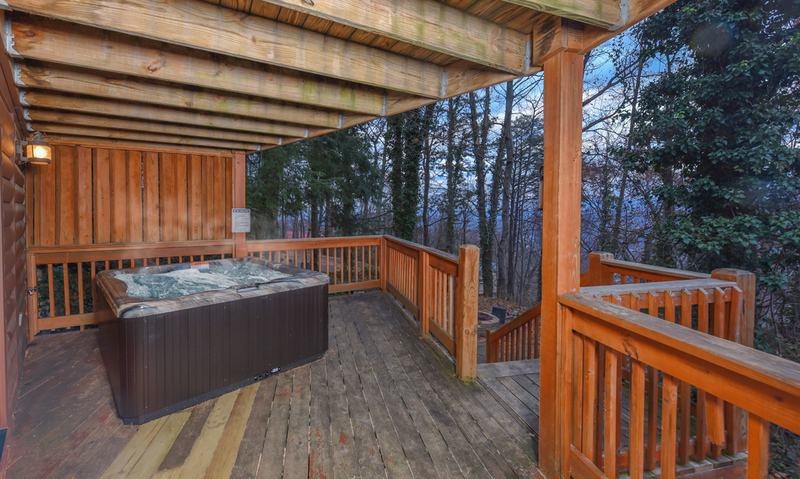 Slip into the bubbling, steamy waters of the outdoor hot tub after a morning of hiking in the Great Smoky Mountains National Park to soothe tired legs and prepare for an incredibly rejuvenating afternoon nap. 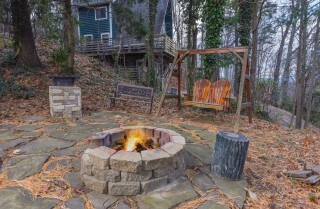 In the evenings, gather around the stone fire pit in the back yard to roast marshmallows with the kids or sip on cold beers at the end of an adventurous day of whitewater rafting on the class III and IV rapids of the Pigeon River. 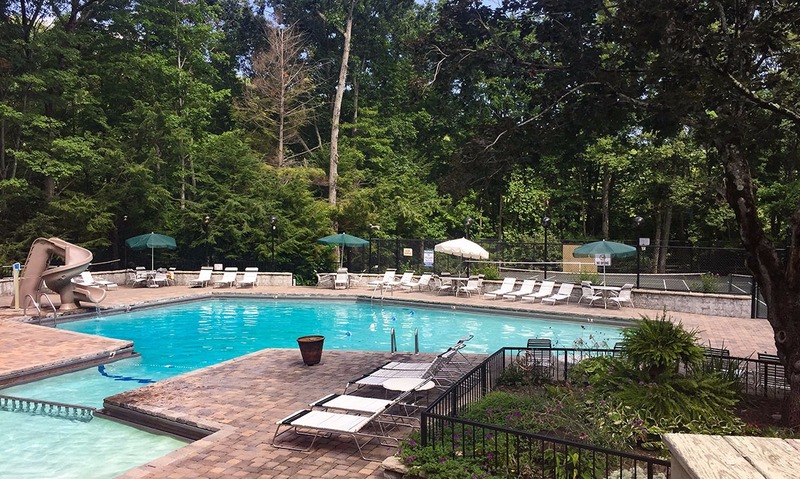 Soak up some sun and cool off while hanging out at the community pool of Chalet Village where the kids can play ping pong in the clubhouse and slide down the pool’s waterslide. 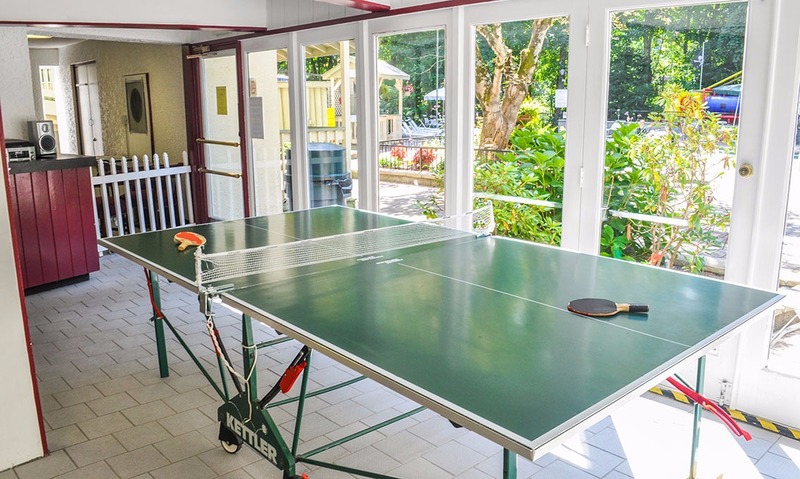 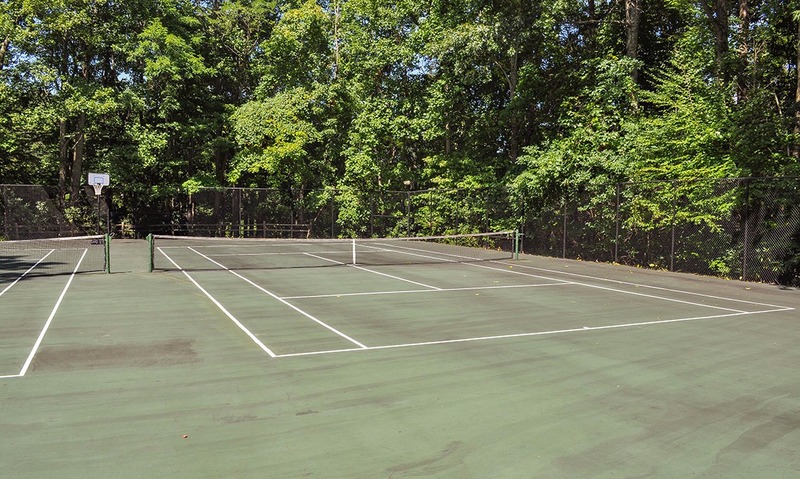 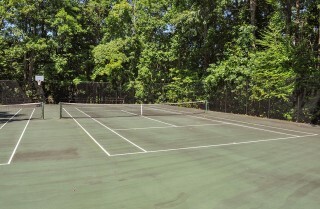 Bring your tennis rackets and balls from home and take advantage of your cabin community’s tennis courts to keep up your exercise routine in between days of delicious meals and sweets in Gatlinburg. Looking for the perfect couples’ or bachelorette activity while experiencing some mountain culture and fun? 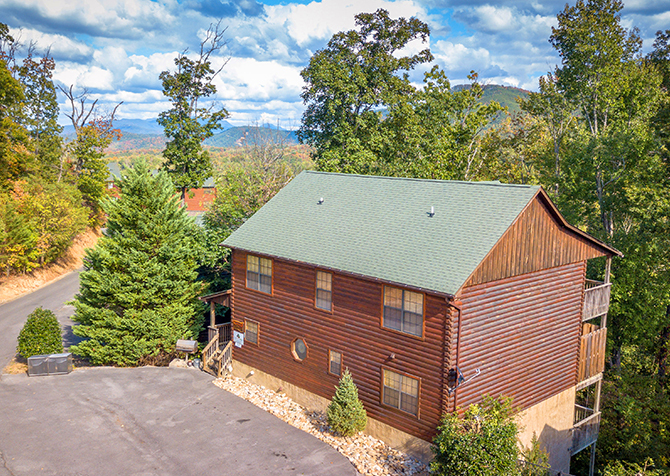 Tour Smoky Mountain wine country along the Rocky Top Wine Trail with the “passport” and try tastings at all 6 locations, like Smoky Mountain Winery; receive a free gift after your 3rd stamp! 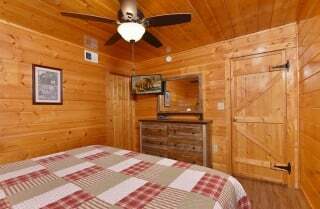 Using many of the same structural and architectural designs of the original Ogle Cabin in which this restaurant is located, The Peddler Steakhouse boasts savory, mouthwatering steaks in an inviting Smoky Mountain atmosphere right on a peaceful, babbling stream. Modeled after a Swiss Alpine village, guests to Gatlinburg visit The Village for everything from souvenirs, delectable sweets, smooth cups of coffee and tea, and lovely sitting areas to enjoy ice cream cones while seated around the fountain.